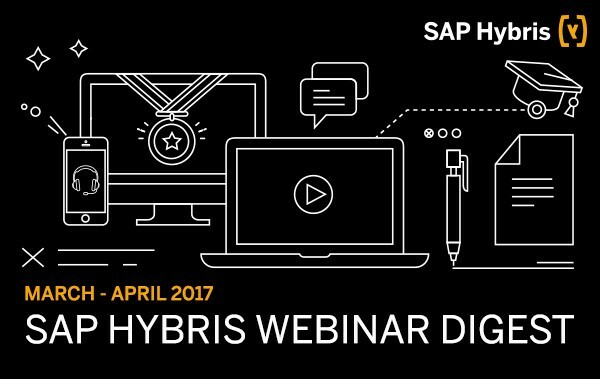 We are pleased to present a fully packed webinar schedule for March and April, with topics spanning the entire SAP Hybris portfolio. Register now and engage with SAP Hybris experts. Learn about the SAP Hybris Commerce product roadmap update for Q1/2017, key initiatives and key theme for 2017. Get a better understanding of upgrade and migration considerations, including key questions to ask. You’ll learn reasons to upgrade and benefits it could bring. We’ll help you evaluate options from technical and functional upgrades to complete relaunch to achieve your goals. Get an overview of the Cloud for Customer architecture, factors affecting end-to-end response times, and performance diagnostics and reporting capabilities. Plus, learn helpful tips for understanding and improving the Application Performance for Hybris Cloud for Customer. Please note: To register for this Meet the Expert session, conducted by the SAP Enterprise Support Academy, you’ll need to have an S-User ID. If you don’t have it yet, please contact your super-administrator or cloud-administrator who can grant you authorizations and permissions. Don’t miss our webinar on Data Workbench and OData services. Data Workbench is the emerging tool that imports and exports data in your system in a simplified manner. Learn how to retrieve your data based on an URL with OData based on the REST architecture. Learn about our latest plans for user experience and receive an important announcement regarding MS Silverlight and Native Mobile Apps. What’s New in Hybris Marketing Cloud’s Q1 2017 Release? Please join Audrey McNichols from the SAP Hybris Marketing Solution Management team to learn what’s new in the latest SAP Hybris Marketing Cloud release. Hello, Thanks a lot for sharing this. The last link is not correct, it opens for “cloud for customer” although it should open for Hybris Marketing. Thank you for pointing that out. I’ve updated the link for the Marketing registration. Note: If you don’t already have a login, you will need to generate a username and password to access the wiki pages.